This Ryobi Devour tool review is sponsored by The Home Depot. I have been compensated for my time and provided with product. All ideas and opinions are my own. This post contains some affiliate links for your convenience. Click here to read my full disclosure policy. For Christmas we got one of those robot vacuums to help with toddler crumbs and such. I was very skeptical, but right off the bat I loved it! All I have to do to is press start on my phone and ‘Alice’ is on her way, sweeping and vacuuming the floor. I started thinking maybe I could get one of those knock offs of the knock offs and put it in the garage to pick up sawdust…wouldn’t that be nice! Within a week, I saw an ad for the Ryobi Devour Cordless Sweeper. Did they read my mind or what? It’s not a robot, but I was eager to give it a try and see how it performed. Assembly is easy, my 8 and 5 year put the handle together and onto the devour, without my help. 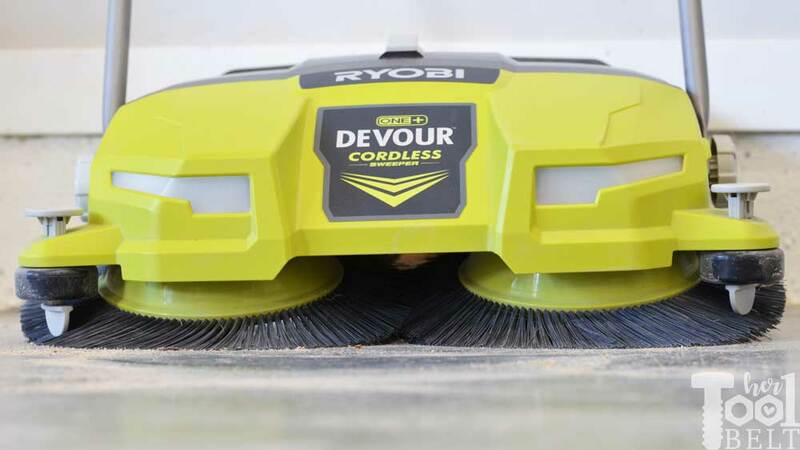 This Ryobi Devour is a Sweeper, it doesn’t have any vacuum suction. Think of a mini version of your town street sweeper machine. 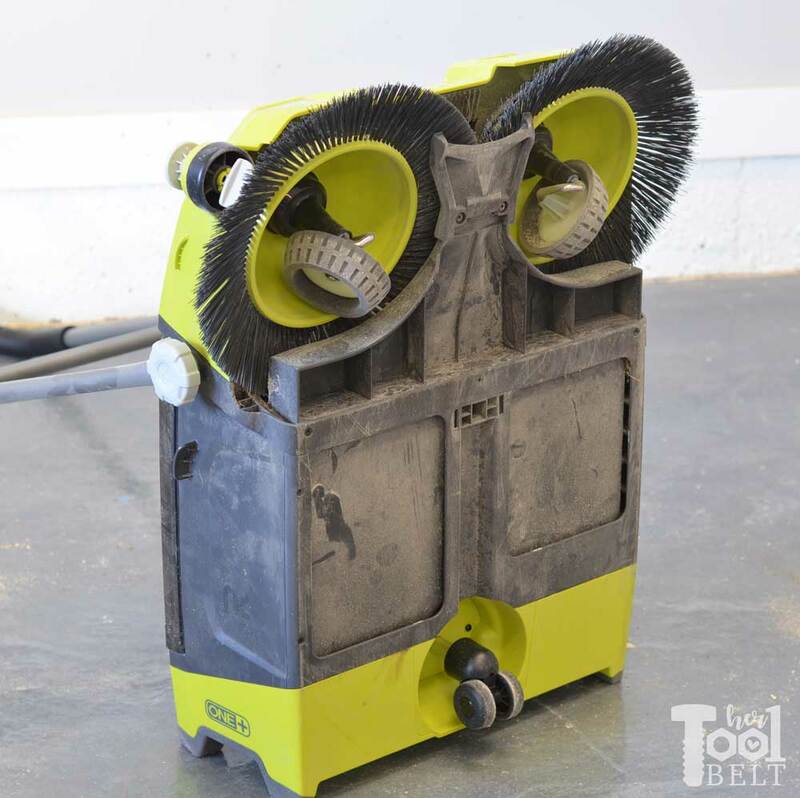 There are two canted round rotating brushes on the front that sweep the debris up the center ramp and into a large dust pan (tub). Here you can see that the dust and debris is swept up the ramp and will go into the dust bin (removed off to the right). The dust bin is 4 1/2 gallons, but in my opinion you could never fill it that full and have the sweeper still work properly. Well maybe you could fill it up will non-dense items like dried leaves. The Devour Sweeper requires one 18v Ryobi battery to run, pop that in on the left. The right side has a very convenient on/off button, that can easily be pressed with the foot. There is also a rotating dial to raise or lower the back wheel. Turn it left for smooth surfaces and right for rough surfaces. For smooth surfaces, it’s like making the dust pan steeper and lowering it for rough surfaces. I didn’t find that this setting made a huge difference. 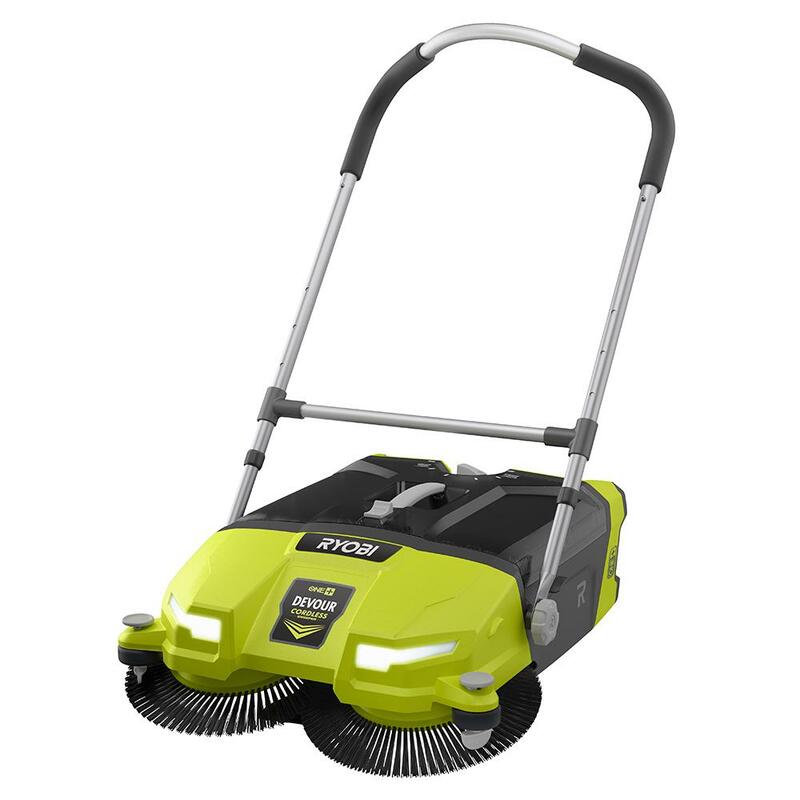 The Ryobi Devour is VERY easy to move around, it’s pretty light weight and doesn’t take a lot of effort to roll. There are 3 swivel wheels that this unit rolls around on. (Don’t mind my dirty undercarriage. 🙂 ) Therefore pivoting, changing direction and pushing are all effortless. Also I like that the Devour can be stored vertical, it’s great to save floor space! For someone like me, who doesn’t particularly like sweeping, this is a very beneficial tool. I like how easy it is to use, and so do my kids (bonus). The Devour worked quite well on the cement surface, but not perfect on the super smooth epoxy (which I expected.) I really like that it can pick up chunks, wood, nails, etc with ease and that it is very quite. Hooray for a cleaner shop! 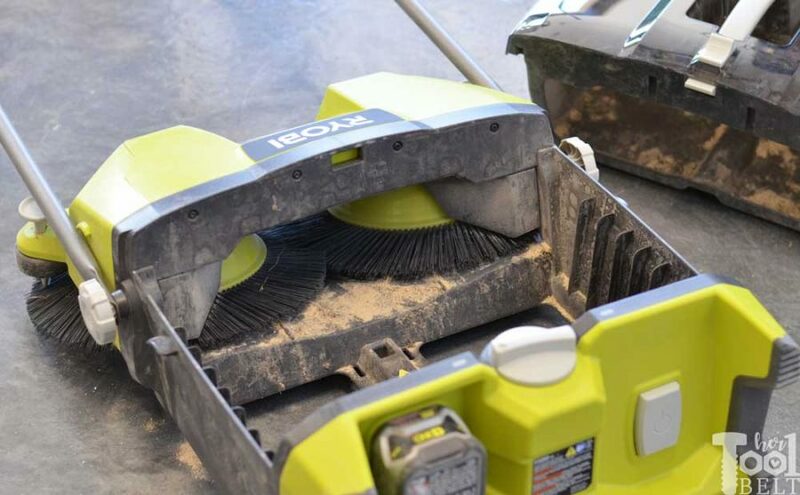 Do you have a Ryobi Devour? Let me know how you like yours and your favorite feature!